^ Bono, U2 - Board of Directors. Debt, AIDS, Trade in Africa. [11 September 2008]. ; Kilgore, Kym. U2 signs on with Live Nation. LiveDaily. 2008-03-31 [2008-09-11]. ^ Boy Review. Hot Press. 1980年10月 [2007-09-06]. ; Boy New Music Express review. NME. 1980-10-25 [2007-09-06]. ; Boy Billboard review. 告示牌. 1980-09-30 [2007-09-06]. ; Boy The Washington Post review. 華盛頓郵報. 1980-09-30 [2007-09-06]. ^ Henke, James. U2: Here Comes the "Next Big Thing". 滾石雜誌. 1981-02-19 [2007-09-06]. ^ Voice of Influential U2 Frontman. BBC. 2006-12-23 [2007-09-06]. ^ U2 lyrics returned after 23 years. BBC News. 2004-10-22 [2009-02-07]. ^ 〈New Year's Day〉在英國單曲榜獲得第10名，在美國廣播放送下紅極一時。 (McCormick (2006)，139頁); Songfacts: New Year's Day by U2. Songfacts.com. [2007-09-06]. ^ Block, Adam. Bono Bites Back. MotherJones.com. 1989-05-01 [2007-09-06]. ^ Net Music Countdown: U2. netmusiccountdown.com. [2007-09-06]. （原始内容存档于2007-08-20）. ^ Pond, Steve. The Joshua Tree Album Review. 滾石雜誌. 1987-04-09 [2008-02-08]. ^ Stokes, Niall. Into The Heart: The Story Behind Every U2 Song. Australia: HarperCollinsPublishers. 1996: 50–51. ISBN 0-7322-6036-1. ^ Henke, James. ''Wide Awake in America'' Album Review. 滾石雜誌. 1985-07-18. ^ DeCurtis, Anthony. U2 Releases The Joshua Tree. Rolling Stone. 1987-03-27. cited in Gardner, Elysa (ed). U2: The Rolling Stone Files. London: Sidgwick & Jackson. 1994. ISBN 0-283-06239-8. ^ Gardner, Elysa. U2: The Rolling Stone Files. 滾石雜誌 (紐約). 1994. xxiii. ISBN 0-283-06239-8. ^ Paulsen, John. Deep Cuts: U2: Part I. bullz-eye.com. 2005-09-20 [2008-02-10]. ^ Mueller, Andrew. U2's Pop reconsidered. andrewmueller.net. [2008-01-08]. （原始内容存档于2010-08-10）. ; Dentler, Matt. U2 makes album world is waiting for. The Daily Texan online. 30 October 2000 [2008-01-07]. （原始内容存档于2008年6月30日）. ; Breimeier, Russ. The Best of 1990–2000 - U2. Christianity Today. [2008-01-07]. ^ U2 Set to Re-Record Pop. contactmusic.com. [2006-10-31]. ^ Tyrangiel, Josh. Bono's Mission. 時代雜誌. 2002-02-23 [2007-03-10]. ^ Hunter, James. Review: All That You Can't Leave Behind. 滾石雜誌. 2000-10-26, (RS 853) [2008-02-08]. ^ Top 10 Super Bowl Halftime shows. Sports Illustrated. [2009-02-01]. ^ 63.0 63.1 Wenner, Jann S. Bono On The Records. Rolling Stone. 2006年2月, (648): 7475. ^ Waddell, Ray. 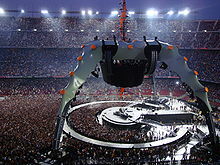 U2 to 'Kiss the Future' on Global Stadium Tour. 告示牌. 2009-03-06 [2009-03-06]. 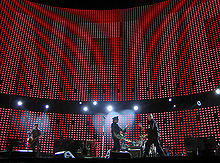 ^ Paul McGuiness on U2's World Tour. Hot Press. 2009-03-04 [2009-03-06]. ^ O'Hagan, Sean. The Wanderers. 衛報. 2009-02-15 [2009-02-15]. ^ Hiatt, Brian. U2 Talk "Horizon" Follow Up, Spider-Man Musical in Rolling Stone Cover Story. 滾石雜誌. 2009-03-04 [2009-03-04].